Honoring an African Bird that Proves if the Shoe Fits, Wear It! Take just one look at Africa’s Shoebill and you won’t need to ask how it got its name – the stork-like bird’s large shoe-shaped bill is definitely a men’s size 16! Despite its enormous bill, the Shoebill always seems to have a happy expression and is listed as one of the most popular birds in Africa. Now this unique bird is the focus of the latest installment in Rwanda’s popular African Wildlife series. Struck by the Mayer Mint in a full ounce of highly-pure 99.9% silver, the 2019 Silver Shoebill is a gorgeous coin with incredible detail and intricate designs. Measuring 40 mm in diameter, this large silver coin features a pair of Shoebills nesting in a clump of leaves. Behind them is an incredibly detailed topographic map of Africa, complete with the mountains and rivers that are home to rich natural resources and abundant wildlife. The obverse of this beautiful coin carries the National Seal of Rwanda and the 50 Francs denomination. Whether you have been to the wilds of Africa, hope to go someday, or simply want to hold a couple of these beautiful creatures in the palm of your hand, this 2019 Silver Shoebill is a great opportunity to bring a piece of Africa to your collection. 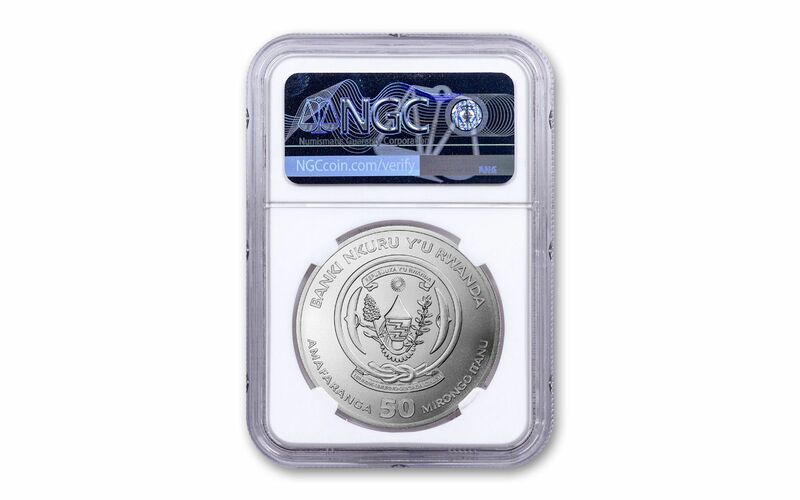 Your 2019 One-Ounce Silver Shoebill has been graded by the Numismatic Guaranty Corporation (NGC) as being in near-perfect Mint State-69 (MS69) condition, a distinction that means your almost-flawless coin will showcase an impressive full strike and indistinguishable imperfections – well above and beyond the quality of the vast majority of coins in the series. In addition, NGC has graded your Silver Shoebill to be a First Releases (FR) coin, a designation that means your coin was received by NGC or an NGC-approved depository within the first 30 days of its release. Collectors seek out these coins because they are produced with new dies and considered to have sharper strikes and deeper mirrors than those that are struck later. Also, the population of coins labeled First Releases is only a fraction of the total mintage. Shoebills prefer to hunt for fish in the lonely swamps of East Africa in a range that extends from Sudan to Zambia. Unfortunately, less than 8,000 of these exotic birds remain in the wild where their numbers continue to dwindle due to the ongoing destruction of their habitat. A typical Shoebill is nearly 5 feet tall and has a wingspan of up to 8 feet. The Shoebill’s goofy-looking bill may look like a cruel joke of evolution, but it’s actually a lethal weapon that’s used to gulp and kill prey. With its glassy, unblinking stare, the Shoebill is known to stand statue-still for hours at a time – so don’t get into a staring contest with this bird. Instead, bring one of these coins home and you can stare it for hours without running afoul of its enormous bill! Order your 2019 One-Ounce Silver African Wildlife Shoebill Coin today, because if you don’t, your chance to get one may soon fly the coop! LATEST COIN IN THE “AFRICAN WILDLIFE” SERIES – This Silver Shoebill continues the extremely popular African Wildlife series. 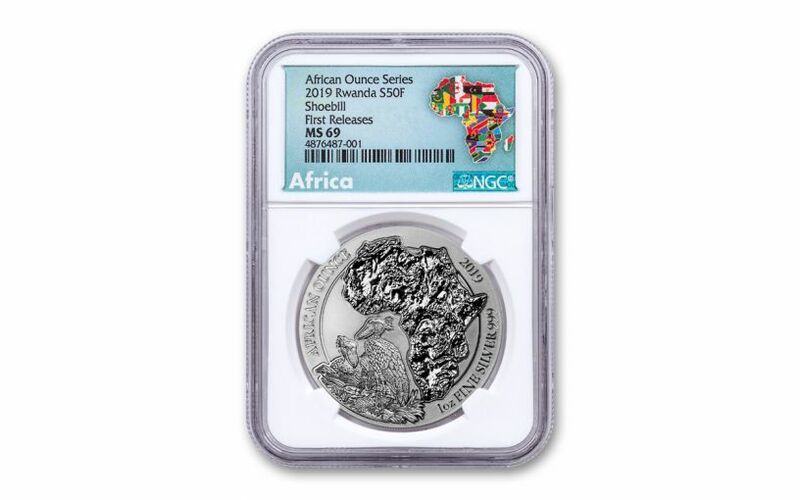 The reverse features a pair of Shoebills in front of a topographic map of Africa, complete with the mountains and rivers that are home to rich natural resources and abundant wildlife. The coin’s obverse carries the National Seal of Rwanda. STRUCK IN HIGHLY-PURE SILVER – These 2019 Rwanda Shoebill Coins are struck in a full ounce of 99.9% silver. RWANDA LEGAL TENDER – Each 2019 One-Ounce Silver Shoebill Coin is 50 RWF Francs Rwandan legal tender, as noted at the bottom of the obverse. Located in the Great Lakes region of Africa, Rwanda is known for its remarkable biodiversity, which is made possible in part due to its mountains, lakes and savanna. GRADED IN NEAR-PERFECT UNCIRCULATED CONDITION – Your 2019 One-Ounce Silver Shoebill Coin has been graded by the Numismatic Guaranty Corporation (NGC) as being in near-perfect Mint State-69 (MS69) condition. KEY FIRST RELEASES CERTIFICATION – NGC has graded your Silver Shoebill to be a First Releases (FR) coin, a designation that means your coin was received by NGC or an NGC-approved depository within the first 30 days of its release. While the fate of these beautiful animals may be uncertain, what is certain is that this coin provides a way for collectors to admire these beautiful animals for years to come. Click one to your cart now to avoid disappointment later.